Ready for St. Pat’s Day? Craving some corned beef and cabbage, but don’t have the time to make it? We’ve got the solution. This dish combines the three most popular elements of a traditional St. Patrick’s Day dinner – corned beef, cabbage, and potatoes – into one scrumptious dish. And you can use deli corned beef rather than cooking your own – a real time saver. So you’ll have more time to celebrate. You lucky leprechaun, you. Prep time for this dish is about 20 minutes. Cooking time adds another hour or so. This dish yields 6 to 8 main-course servings. Leftovers keep well for about 3 days if refrigerated in an airtight container. Preheat the oven to 375 degrees F. Bring a large pot of water (at least 6 quarts) to a boil on the stovetop. While the water is heating, cut a head of cabbage in half (reserving one half for another use). Remove the outer leaves if they’re wilted or soiled. Core the cabbage, then cut it into pieces of about 1 inch (we find the easiest way to do this is to cut the cabbage into 1-inch slices going north to south, then turn the cabbage 90 degrees and repeat). When the water comes to a boil, add a tablespoon of kosher salt to season it. Add the cabbage and blanch it for 3 to 5 minutes, until it’s just tender (it's OK if it's still slightly crunchy). Drain the cabbage, then plunge it into a large bowl of ice water. Allow the cabbage to cool. Meanwhile, shred the corned beef. If using deli-sliced corned beef, stack the slices and cut them into halves or thirds lengthwise. Then turn the slices 90 degrees and cut them into ¼-inch pieces. If using corned beef that you have prepared yourself, first cut off most of the fat cap (see Notes). Then cut it into slices of about 1/8-inch thick (or a bit more). Stack the slices, then cut them into halves or thirds lengthwise. Turn the slices 90 degrees, then cut them into ¼-inch pieces. Set aside. Peel the onion and cut it into dice of about ½ inch. Set aside. Peel the garlic and cut it into thin slices or mince it finely. Set aside. Wash and peel the potatoes. Cut them into thin slices. Drop the potato slices into a bowl of water to keep them crisp and fresh looking. Heat a large frying pan over medium stovetop heat. When hot, add the oil. When the oil is heated (it’ll shimmer – about 15 seconds), add the chopped onion. Season to taste with salt. Lower the heat just a bit and sauté the onion for 8 minutes. Meanwhile, add the milk and cream to a 2-quart saucepan and heat it on the stovetop over lowish heat (you don’t want to scorch the dairy). Warm the milk/cream to a simmer, or just below (this step is optional – see Notes). Grate the cheeses. You may find it easiest to do this in a food processor. After the onion has cooked for 8 minutes, add the chopped garlic, the dried thyme, and the caraway seeds. Cook for 1 minute. Then drain the chopped cabbage and add it to the onion mixture. Add the shredded corned beef and stir to combine. Cook until the cabbage and corned beef are warm – about 3 or 4 minutes. Taste, then add more salt if necessary. Butter (or oil) a 3-quart casserole dish. Drain the potatoes. Remove the milk/cream mixture from the heat. Ladle about ½ cup of the dairy mixture into the casserole dish and spread it around the bottom. Add a thin layer of potatoes, overlapping the slices slightly to form a solid layer. Then spoon about half the cabbage mixture onto the potatoes. Sprinkle about ¼ of the Swiss cheese over the cabbage, then ladle another ½ cup or so of the milk/cream mixture over the cabbage. Then add another layer of potatoes. Cover with the rest of the cabbage mixture, plus another sprinkle of the Swiss cheese (about ¼ of it), then another ladle of milk/cream. Form a final layer of potatoes. Pour the remaining milk/cream mixture over the top (spread it out – it will sink into the casserole dish). Top with the remaining Swiss cheese (about half of it) and the Parmesan cheese, spreading the cheese out to cover the potato layer. Place the casserole into the preheated oven (we put the casserole dish on a rimmed sheet pan in case some of the milk mixture bubbles over). 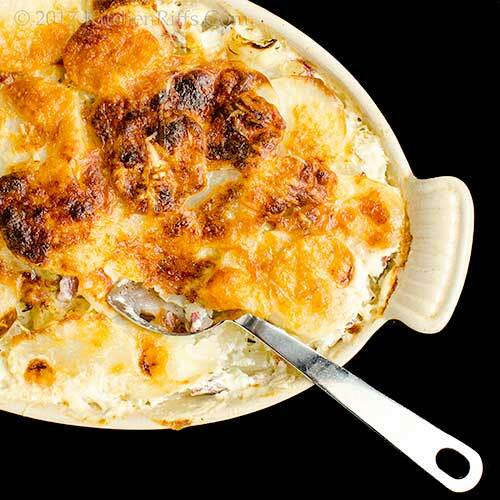 Bake the casserole until the potatoes and cabbage are tender, the milk mixture has condensed and is no longer runny, and the cheesy top is golden brown. This usually takes about 45 minutes, but it could take up to an hour. Remove the casserole from the oven. Let it sit for about 10 minutes (to cool and solidify). Then serve, garnishing with a sprinkle of chopped parsley if you wish. Exact quantities aren’t critical in this recipe. You can adjust to your own taste (we often add more potatoes). Speaking of quantities, we measure more by weight than volume most of the time. We find it easier, and good kitchen scales aren’t expensive (once you start using one, you’ll wonder why it took you so long). So we’re actually approximating quantities by volume here, but we’d guess that 1 pound of chopped cabbage yields 3 or 4 cups (same for sliced potatoes). A pound of corned beef translates to about 2 cups when shredded. As for the cheeses: When shredded and packed tightly, four ounces of Swiss cheese yields about 1½ to 2 cups; one ounce of Parmesan yields about ½ cup or a bit more. But that’s eyeballing the ingredients, not measuring them by volume. Instead of using just parsley as a garnish, you could chop some carrots, glaze them, and toss them with the parsley. Corned beef can be fatty. Typically, there’s a fairly thick (up to 1 inch) fat cap that covers much of the meat. If you buy corned beef from the deli, most of this will have been removed. If you’re cooking your own corned beef for this recipe, you’ll need to cut off most of the fat cap: Just let the corned beef cool after you’ve cooked it. Then remove most of the fat layer and proceed with shredding the corned beef for the recipe (Step 3). Have leftovers on hand from a traditionally cooked corned-beef-and-cabbage dinner? You can use them as ingredients for this recipe. You won’t need to blanch the cabbage (Step 2), but otherwise just follow the procedure above. And speaking of blanching the cabbage, you can skip this part of the recipe if you want. We do it simply because it helps preserve the color of the cabbage. But if you want to skip this step, just sauté the cabbage for an extra 3 to 5 minutes in Step 8. Worried about the odor of cooked cabbage? Fret not. That odor generally develops only if you boil cabbage for too long. In this case, you’ll be baking the cabbage with other ingredients, and the odor just won’t happen. Plus, when you cook cabbage this way, the flavor becomes a revelation – it’s very sweet and savory. Instead of using a milk/cream mixture (or half-and-half), you could use just milk alone. The dish won’t be as rich, but it will still be good. It’s not critical that you warm the milk/cream for this recipe (Step 6). We suggest doing so because it cuts down on baking time. If you don’t warm the milk/cream, you’ll just need to bake the gratin for an extra 15 minutes or so. We list caraway seeds as optional in this recipe, but we recommend using them; they combine beautifully with cabbage. Start with ½ teaspoon if you’re not sure you’ll like the flavor (with that amount, you’ll get just a hint of caraway). We use kosher salt for cooking. This is coarser than regular table salt, so it doesn’t seem as “salty” by volume. If you’re using regular table salt, start with about half as much as we suggest. But, as always, season to your taste, not ours. “Yup, and maybe we could have some Irish Coffee as an after-dinner drink,” said Mrs K R.
Check. Mrs K R speaks softly, but she carries a big shillelagh. Only one problem: the recipe just makes way too much for a small family! I'd love to try it otherwise, as I adore Gratin Dauphinoise which is the French version (no cabbage or corned beef though). It must have been over 30 years since I last had corned beef. Thumbs up for you making your own corned beef, John. This is a hearty and delicious dish. Hi Mae, this does make a lot! We solved that problem by giving some of it away! And yup, this is similar to a Gratin Dauphinoise. Thanks for the comment. Hi Angie, we always seem to have corned beef in some form or another at this time of the year! Good stuff, isn't it? Thanks for the comment. I have some leftovers from my traditional corned beef dinner. I was going to make barley soup but your scalloped potatoes look so delicious that I will make them and forget about my soup. This is a must make, John! It looks delicious and is my kind of food! Caraway seeds are not optional! They're great in these type dishes. And the Irish coffee afterwards is a must! Happy St. Patrick's Day! Hi Gerlinde, you'll be glad you did! :-) Thanks for the comment. Hi Pam, you'll love this -- terrific flavor! Happy St. Patrick's Day, and thanks for the comment! Well now aren't you 10000% ready for ST PATTY'S DAY!!! I am definitely not - gah!! I need to at least eat ALL the green food on Friday! Hi GiGi, we are ready! Mrs KR even made some of those Irish Potato Candies last week -- they're terrific! Thanks for the comment. I love the idea of using a deli sourced corned beef. I havent made my own EVaH! This looks delicious!! Hi Ansh, deli corned beef is usually pretty good quality. Pricey, but it same you a lot of time, so worth it IMO. Thanks for the comment. 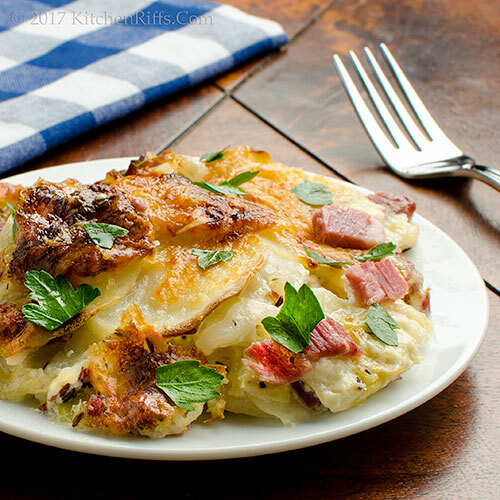 Oh John, your scalloped potatoes with cabbage and corned beef just look and sound fantastic...I love the idea of one pan meal...and this one has it all. Hi Juliana, this really is a yummy dish -- extremely tasty and satisfying. :-) Thanks for the comment. YUM! I love everything about this tasty casserole. Delicious. Hi Natalia, isn't this a great combo of flavors? SO good! Thanks for the comment. Hi Pam, this is a great dish -- delish is exactly the word. :-) Thanks for the comment. 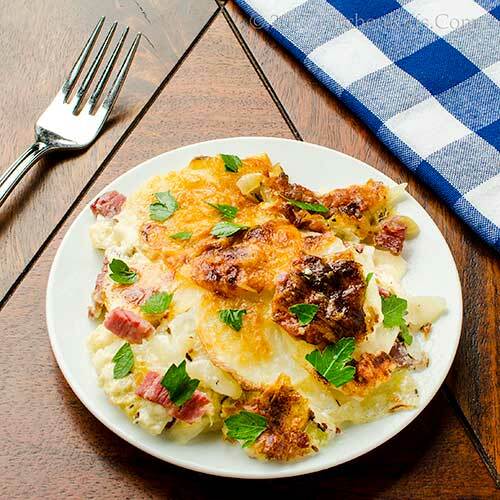 Absoluelty loving the idea of combing corned beef, cabbage, and potato gratins in one dish. This would surely make a great St. Patrick’s Day's meal. Hi Anu, these kind of dishes are fun, aren't they? Love the flavors in this one! Thanks for the comment. What a perfect dish to serve on St. Patrick's Day! I'll have to make my own corned beef one day using your recipe too. Although I'll be away this year I'll definite save the recipe for a different occasion. Thanks for sharing! Oh yes, this sounds absolutely delicious, John. (Although I must admit we're not eating too many spuds these days. Peter is dieting and my silly tummy cannot digest them so easily). This would be perfect for that weird turn of weather you're experiencing right now. Isn't it snowing over there?! Saint Patrick's Day? OMG, I just remembered it's my daughter's birthday- I must get her something! Maybe she'd like a serve of your corned beef dish- certainly looks good! Hi Yi, corned beef is good stuff! Although you have no lack of good corned beef where you live. :-) Thanks for the comment. Hi Evelyne, those Irish Potato Candies are dynamite. As is this dish. :-) Thanks for the comment. Hi LIz, celery root would make a nice substitute for the potatoes, I'll bet (haven't tried it in this dish, but love that veggie in gratins). And yes, we did get some snow earlier this week. Melted really quickly, thank goodness! Thanks for the comment. Hi Fran, although this is a good dish, somehow I don't think your daughter would be too thrilled to receive it as a present. :-) Thanks for the cmment. Hi Barb, LOL! I appreciate the social media love. There are so many platforms these days -- hard to keep up! Thanks for the comment. The perfect dish for St. Patrick's Day and the rest of the year too. Scalloped potatoes! Why yes, much better than boiled! A scrumptious version of the classic St. Patrick'e Day dinner. Hi Denise, it's a lovely dish -- tons of flavor. :-) Thanks for the comment. Hi Deb, yup, hard to beat potatoes with cream and cheese. :-) Thanks for the comment. I love all-in-one dishes because you can make it and forget it while enjoying one of your very special cocktails. I've never been a real fan of corned beef and cabbage but I adore the potatoes so all together it would be a delightful meal for me. Hi Maureen, we like dishes like this for exactly the same reason! I do like the traditional corned beef and cabbage, as long as the cabbage isn't cooked to death. Thanks for the comment. Hi Pat, you'll like this! Tons of flavor. :-) Thanks for the comment. This is genius! Love those casseroles that combine it all in one. This is so much easier than making the 3 separate dishes. Love it! Thanks John and hope you have a fun St. Paddy's Day! Hi MJ, isn't this a fun dish? Love one-dish meals like this. :-) Happy St. Pat's Day, and thanks for the comment. This is genius indeed! I just looked at it and wanted to grab it! Hi Marta, this does kind of say "eat me", doesn't it? :-) Thanks for the comment. Hi Tricia, by all means, link away! And you've hit on exactly why we developed this recipe: we often don't want an entire brisket, just a taste. So buying deli corned beef and using it in this dish is the perfect solution. Thanks for the comment. Good Catholics that we are, we eat fish on Fridays during Lent. But because St. Patrick's Day is on a Friday this year, we get a reprieve! (I like fish; never thought it a penance.) Anyhow, the grandkids (fish-haters) are coming this weekend, so you've solved my dilemma! Hi Rosemary, bet your grandkids will love this! :-) Thanks for the comment. Hi Carolyn, you're in! :-) Thanks for the comment. 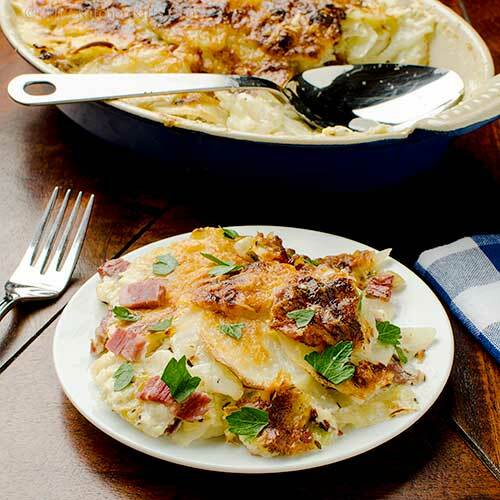 What a dellicious meal John, I love scalloped potatoes but you have brought these to a whole new level and it's a one pot meal to boot. Happy St. Patrick's Day! This is inspired, John! Our neighbors are making an enormous amount of corned beef and we are the lucky guests...perhaps I'll be able to use some leftovers to make this gorgeous dish and share with them. Thank you! Hi Cheri, scalloped potatoes are hard to beat, aren't they? And they're so versatile -- as this dish shows! Thanks for the comment. Hi Hannah, sounds like you're going to have a fun St. Pat's! Thanks for the comment. This is brilliant!!! I am totally making it this weekend. Corn beef is on sale at every market near me. Hi Alyssa, best price of the year for corned beef at the moment! :-) Thanks for the comment. such a fabulous and indulgent way to get all the traditional St. Patrick's day flavors in one dish! Happy St. Patty's to you and Mrs. KR! Hi Shannon, this definitely is indulgent. Which means good, of course. :-) Happy St. Patrick's Day, and thanks for the comment. This sounds so comforting, what a great way to use a store cupboard staple like corned beef. I'll have to give this a try. Hi Caroline, this is indeed comforting. Best kind of food! Thanks for the comment. I love all three of the main ingredients in this dish. Thanks so much for the helpful notes. Hi Jeff, we love those ingredients too! :-) Thanks for the comment. Googled looking for a casserole with CB, C, and P.... I don't do well making the traditional dinner because I like the P & C to get the flavor of the CB and I never time things right. Meat not cooked long enough, veg overcooked... So I've been going out for my fix. But most restaurants cook the components separate (I guess to avoid the dilemma I referenced) so the P & C are bland. And then you introduce CHEESE into the mixture!!! Call it love at first site. I'm going to give this a try for sure next year, or maybe sooner! Happy St. Patrick's Day! Great dish, and perfect since we're still having wintery weather! When I was still living at home, we lived in a townhouse. We went away for the weekend and when we returned Sunday, our house smelled like someone had died in it! Our neighbour cooked cabbage all weekend! Argh!!! Hi Tina, cheese makes everything better! When I cook a traditional boiled dinner, I'll usually begin adding the veggies after the corned beef as cooked an hour or so -- that way the veggies don't overcook. But this dish is even easier! :-) Thanks for the comment. Hi Eva, overcooked cabbage isn't nice, is it? The only aroma with this dish is a pleasant one! :-) Happy St. Patrick's Day, and thanks for the comment. Capital Grille used to have the best potatoes gratin. I haven't had it in years and I think it's different there now. But, I've never made my own. Went to tbe market today and gathered all the ingredients. The recipe looks and sounds delicious. I'm off to the kitchen to prepare it - my boys are in for a treat tonight. Happy St. Paddy's Day! Hi Laura, love potatoes in gratins! SO good. :-) Thanks for the comment. Hi Vanessa, enjoy! We love this dish. :-) Happy St. Pat's Day, and thanks for the comment. This looks amazing John, I love gratin but never had it with cabbage or beef before. A very pleasing comfort food indeed. Thanks for sharing. Hi Amira, the cabbage turns very sweet yet savory in this dish. Really good! Thanks for the comment. Hi Marcelle, this is a great way to use the leftovers from a corned beef dinner, too! :-) Thanks for the comment. Looks real yummy. A great way to "recycle" leftovers, too, I imagine. Hi Frank, it is yummy! And leftovers are really good in this! Thanks for the comment. Bill doesn't like corned beef, but I think he'd enjoy this cheesy potato gratin! A great recipe for leftovers!! Hi Liz, it's pretty easy to cut the amount of corned beef in this dish. Bet Bill would like this -- who can resist cheese? :-) Thanks for the comment. LOVE this casserole, John! What a perfect one dish meal. Of course, you could have just used potatoes and I would be a happy camper. But just think of the possibilities of most any leftover protein! Hi Anne, yup, I'll bet any protein would work in this dish. And love the combo of potatoes and cabbage! Thanks for the comment. Hi Merryn, those end-of-post exchanges are pretty true to real life. :-) This is a fun -- and tasty! -- recipe. A really good one. :-) Thanks for the comment. Love that golden crust on top! Happy late St. Patrick's Day. Looks like you had a great celebration. Hi Lisa, we're suckers for that crust! One of the reasons we love a gratin. :-) Thanks for the comment. YUM!!! This definitely sounds and looks delicious and comforting. I need to make this. Hi Vicki, you do need to make this! :-) Thanks for the comment. Potato Gratin and all the extras, so so good. Love the crispy bits. This looks hearty and I am craving it now. Btw, just adore the conversations you two have. Hi Asha, we enjoy those conversations too! :-) And this is a wonderful dish -- SO full of flavor! Thanks for the comment. We don't celebrate St. Patrick's, but who needs a special occasion to enjoy such a delicious meal? This looks really, really superb! I love it as a change-up to the usual corned beef & cabbage dinner. Just need a Guinness and we are all set! Hi Katerina, I think for most of us St. Patrick's Day is just an excuse for a party. :-) Thanks for the comment. Hi Amy, I can personally attest a Guinness goes wonderfully well with this dish. :-) Thanks for the comment. Interesting addition of cabbage in the gratin. It looks good and I am sure it tasted delicious too! Hi Shibi, love the combo of cabbage and potatoes! So good! :-) Thanks for the comment. That's what I call comfort food in my house. Right now I can; t make these type of dishes, although I am craving them badly, because of the heat but once it will start to rain in a couple of weeks, I will be trying your delicious looking gratin. Hi Helene, this is good rainy day fare! Thanks for the comment.